Often considered to be a budget style fence, chain link fencing has many uses and numerous benefits. At New Jersey Best, we carry a complete line of chain link fencing products for every residential or commercial project. We stock galvanized and System 21tm coated products, and we can take your fencing as far as you require. Whether you’re considering chain link fencing for your home or business, we have a range of products available to suit your requirements. Also known as wire netting, a chain wire fence, wire mesh fence, cyclone or hurricane fence; chain link fences are a special type of woven fence that are generally made from galvanized or System 21tm coated steel wire. The galvanized wires run vertically from the top of the fence to the bottom of the fence, bent at 45° angle around each other so that they form a pattern that looks like a diamond. As such they are also often referred to as Diamond fences. The most common type available is a 2-inch pattern that has a 9 gauge wire. Although chain link fencing might seem drab on your residential property, it is extremely cost-effective, durable and easy to install. There are numerous benefits to chain link fencing, which is why they are a popular option for both residential and commercial property owners. Chain link fences are much easier to install than many other types. The installation process is fairly straightforward and if you hire a professional, like our team here at New Jersey Best, you will save time and money. Chain link fences are also cheaper than other options available. In fact, you might find that chain link fences cost half the price of other types. This makes it ideal if you are working on a budget, have a large property or if you are after a simple fencing solution that lasts. Thanks to the interwoven design and the use of galvanized, LLDPE-coated or System 21tm steel wire; chain link fences are designed to last. Unlike other fence types, such as wood fences, you don’t need to worry about them rotting or needing replacement. The use of steel makes it impossible for many pests, including termites, to damage your fencing. One of the biggest benefits of chain link fencing is that the woven fence, which is made up of interlocking wires, are bent in a pattern that makes it hard to break. This is why you’ll find chain link fences used at prisons, airports, military bases and other high-security areas. They can range anywhere from 2 feet high to 15 feet high (or beyond), making them ideal for keeping unwanted guests out and wanted guests in. Chain link fences are also designed to withstand the weather, hence the name “hurricane fencing”. 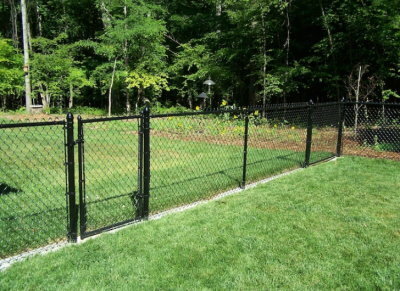 At New Jersey Best, we have a range of varieties of chain link fence. You can choose a color, from staying natural with the silver steel to coating it bright pink – the options are endless. They are also easy to mix and match with an assortment of gate designs, depending on your requirements. Galvanized steel wire is coated with colored poly coatings for additional protection, while the system 21 fence system provides a resilient protective layer, available in green, black, and brown. Because chain link fences are so simple, yet so durable, they are very easy to maintain long in to the future. If the fence is damaged in any way, simply cut and replace that section of the wire. 1. The materials: you’ll generally pay between $5 and $15 per linear foot for a chain link fence that measures a few feet high. The higher you go, the more you pay per linear foot. The wire itself will also affect the cost, as the thicker it is, the more expensive it will be. You’ll find that chain link fencing generally comes in 11.5 and 9 gauge wire – with the 9 gauge costing a lot more. If the wire is uncoated, you will pay less than if your wire is coated. 2. The cost of labor: Get in touch with our team at New Jersey Best to discuss our general labor rates. 3. Enhancements: keep in mind that you will also pay more if you plan on having your fence enhanced at all. This includes gates – which cost anywhere from $50 to around $100 (if the price isn’t included in your per linear foot installation fee); added privacy options, for example, chain link slats; and fabric screens which are generally hung on the outside of the fence, giving you added privacy. When considering the cost of your fencing, you might also need to keep in mind the local building codes, alternative materials, any digging required, maintenance fees, and fencing permits. If you are unsure about any of the above, contact our team to discuss. Why choose us for your chain link fencing? There are many benefits to a chain link fence. Be sure to get the type of fence that meets your exact needs. At New Jersey Best, we have local knowledge and experience that is 2nd to none. This allows us to provide you with everything you need to ensure the security of your property. 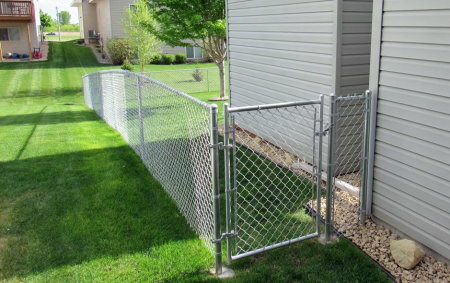 Our chain link fences are available in all styles with matching or custom designed gates.